NAY PYI TAW -- Turkey's foreign minister has emphasized the shared history between his country and Myanmar during a visit to the Southeast Asian country's capital Monday, and underlined his determination to assist "all" in the impoverished region of Rakhine, not just the area's Muslims. 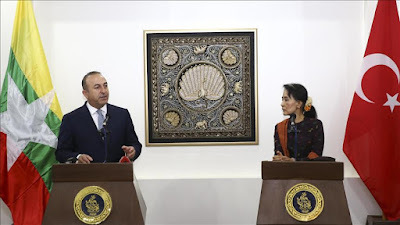 Mevlut Cavusoglu -- speaking after a meeting with Myanmar Foreign Minister Aung San Suu Kyi -- stressed to reporters that Turkish aid groups did not discriminate between peoples, "actively reaching out to all areas in need, making roads and opening health clinics across the country." Since 2012, Rakhine -- home to more than one million Rohingya (described by the United Nations as the world's most persecuted minority group) -- has been troubled by communal violence, with Rohingya and other ethnicities and religious groups reliant on aid in internally displaced person camps. “The difference between us and other countries is that we do not impose projects, instead we ask for projects from central and domestic governments," Cavusoglu said. "Authorities in these countries know what is needed better than us, which is why we will continue to work with the central government in this respect." In response to a question from an Anadolu Agency correspondent, Suu Kyi -- who also fills the position of State Counselor -- thanked Turkey's foreign minister for his sensitivity on the matter and said she hoped that his comments would prove a lesson for all. Suu Kyi has been placed under tremendous international pressure to solve problems faced by Rohingya in the country, but has had to play a careful balancing act for fear of upsetting the country's nationalists, many of whom have accused Muslims of trying to eradicate the country's Buddhist traditions. Cavusoglu had earlier emphasized during a one-on-one meeting with Suu Kyi that Turkey would continue to provide fundamental humanitarian aid in the region without discriminating based on ethnicity, language or religion. "We will show support toward Arakan [Rakhine] until the problems are solved,” he said, adding that the Turkish government welcomed steps he said had been taken by the new government to grant citizenship rights to Rohingya Muslims. Diplomatic relations between the two countries began officially in 1958, but it was not until 2012 that Turkey opened an embassy in Myanmar. Although then-Foreign Minister Ahmet Davutoglu paid a visit in 2012 and 2013, Cavusoglu is the first Turkish official to visit the country since Suu Kyi's National League for Democracy (NLD) won the Nov. 8 election. On Monday, however, Cavusoglu underlined that relations went back even further than 1958. “Turkish soldiers held hostage in World War I were taken to Myanmar, where they were forced to work and build national parks as well as many other buildings used today under tough conditions,” he said, of the former British colony. According to Turkey's Foreign Ministry, two war cemeteries exist in Myanmar of Turkish soldiers captured by the British during WWI. “Today, Turkey is one of the greatest supporters of peace and prosperity in Myanmar," added Cavusoglu. "With the opening of our embassy in 2012, greater cooperation has taken place between us. In the same manner, in the past four years Turkey has increased its humanitarian aid, contributing $13 million toward the health and education sector,” he said. Rohingya and Kaman Muslims are just two of country's many ethnic groups, although Rohingya is not considered an official group -- a stance long celebrated by nationalists who refer to the group as "Bengali" which suggests they are interlopers from neighboring Bangladesh. Cavusoglu underlined to the audience the complexity of the situation, highlighting that there are 135 ethnic groups in Myanmar. “This is actually the richness of this country. Diversity should be seen as something rich, and it is important that Muslims are also included in this picture," he said, stressing that the new government "is" paying attention to these issues. "Turkey has experienced a similar procedure, and we are willing to be in close cooperation with the central government to find a solution for the problems faced by Muslims. We will support positive steps taken, and through TIKA [the Turkish Cooperation and Coordination Agency] we will continue humanitarian aid. Cavusoglu was later greeted by Myanmar’s first civilian head of state, President Htin Kyaw, at his official residence. He also met with the country’s military chief, Senior Gen. Min Aung Hlaing, during a meeting attended by Turkey's ambassador to Myanmar, Murat Yavuz Ates.